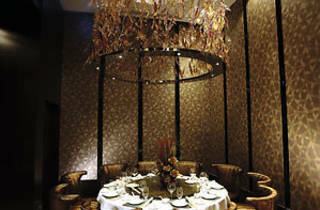 As soon as you walk into the glamorous dining room at Jardin de Jade your expectations for the food skyrocket. 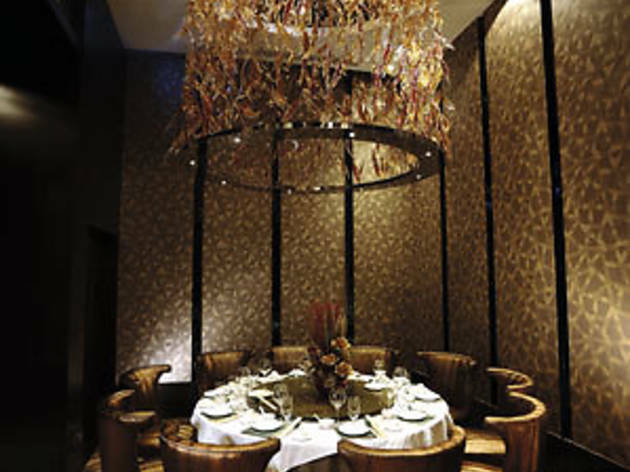 The grand double-height ceilings and neo-Vegas-esque décor serve to remind you of the fame of this restaurant’s sister eatery in Shanghai and Macau. The menu is a beautiful photo album of the restaurant’s specialities. Regional Chinese with an emphasis on Shanghainese cuisine was featured in every section, from the cold starters to dessert. To try their much-talked about Jardin de Jade smoked duck, you will need to order it in advance, which sadly we only learned at the table. Instead, we started off with two cold Shanghainese dishes: smoked blue fish ($58) and bean curd roll ($42) sometimes called mocked duck. The smoked fish was beautiful: dry, tender and full of bones, which you are supposed to eat. The seasoning penetrated the flesh all the way through and the taste lingered until the next course. The beancurd roll with sliced mushrooms was fried in too much oil, a theme that reoccurred throughout the meal. Beautiful food photography can sway one’s judgement, and we picked a glossy photo of bok choy braised in chicken stock and “abalone” mushrooms ($68). These aren’t the abalone mushrooms that we know and love but another variety of thick stemmed mushrooms that have been prepared to give the appearance of abalone slices. The mushroom slices were first fried then braised with rich chicken stock, which gave a heavenly sweet and meat-like experience. The bok choy was also cooked in this rich stock and, although it was cooked perfectly, we found a bit of sand in each bite. Forget the Shanghainese noodles ($68). The $7 cart variety would have been preferential to what arrived on the plate. Dried store-bought noodles came stir-fried with a few strands of bean sprouts and baby bok choy. It tasted of nothing. Not even salt. If you are looking for the carbohydrate portion of your meal, then we suggest a bowl of rice. The rice is medium-grained and cooked to fluffy perfection. A bowl of Sichuan pepper-tainted beef slices with bean sheet noodles and cabbage ($88) appeared late in our meal. As with most of their dishes, they got it 50 per cent right, but couldn’t quite see it through. The beef slices, criss-cross cut and plump, were technically fine. They failed on spicing up the dish. Again, bland flavours for a dish that is known for its heat. And again, far too oily. A word of warning: there are a few cold dishes that arrived when we were seated. Though they might seem complimentary, we noticed a per person charge for them on the bottom of our receipt. If you don’t want them, be sure to inform your server. Shop G3–4, G/F, Sun Hung Kai Centre, 30 Harbour Rd, Wan Chai, 3528 0228. Daily 11am–11pm. Meal for two: around $450.